Day 193 / Hat 193: Light brown wool pakol, with interior tag that reads: "Durdana Khan Cap House" Shop #1, Bazar Islamabad Peshawar City." This lid from afar was purchased from a vendor in Kabul, Afghanistan, by the brother-in-law of my co-worker Chris Reynolds who generously loaned it to the Project for today's installment. "My brother-in-law could tell you what he was doing in Afghanistan, but then he’d have to kill you," says Reynolds (which means he's likely an insurance agent or something along those lines). I'd never heard of a pakol before so I did a little searching. Among the things I discovered: Before beng fitted, the hat resembles a bag with a flat, round bottom. The sides are then rolled up to form the rounded brim of the hat. The Wikipedia entry says " It is seen as a hat of the Afghans including the Pashtuns, but also of other ethnic groups of the Hindukush mountain range such as Chitralis, Nuristanis and Shamaliwals of Afghanistan." A nifty feature of the pakol is that, in cold weather, the sides can be rolled down to cover the ears. 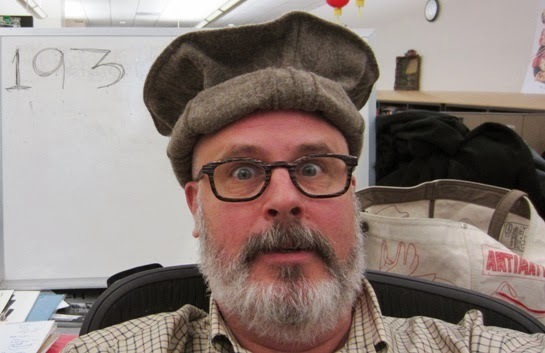 Today's tip o' the pakol goes to Chris Reynolds for the loan of the lid - and the lesson!